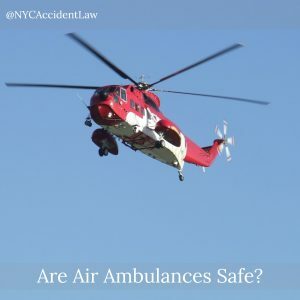 Jonathan C. Reiter Law Firm » General Aviation » Are Air Ambulances Safe? Whether they’re called life flights, air ambulances, or medevacs, air ambulances perform a vital service. They get people who have been seriously injured away from the scene of an accident and to the hospital much faster than a typical ambulance that must contend with traffic and conventional roads. Air ambulances, which are typically helicopters, are also capable of flying injury victims to trauma centers located in distant cities or states, where the injured can received specialized care from top medical experts. Air ambulances are more popular than ever before. In 1980, there were fewer than 50 of these aircraft in the country. By 2008, there were 668 medical transport helicopters flying for more than 200 hospitals across the United States. But how safe are these aircraft? It’s devastating when an air ambulance crashes. When crashes happen, they claim the lives of the injured as well as emergency medical personnel who work so diligently to help injury victims. In April 2017, an air ambulance crashed in Texas, killing all three people on board. According to news reports, the helicopter had just left the airport when the crash occurred. In November 2016, an air ambulance plane crashed in Nevada while transporting a heart disease patient to Utah. Everyone on board was killed. The aircraft was a twin engine plane that reportedly experienced mechanical problems after takeoff. The plane lost altitude and crashed in a parking lot in northern Nevada. Unlike commercial airline pilots, air ambulance pilots must land in a variety of conditions and environments. Accidents happen all over the place, including the middle of busy highways. Air ambulance pilots must contend with telephone wires, trees, and other obstacles. It’s rare that they have the option of setting down on a flat helipad. And because more car accidents happen at night than during the day, air ambulance pilots must often fly at night, when visibility is less than favorable. All of these factors can make for more dangerous flying conditions that put patients, flight crew, and pilots at risk. If you’ve been injured in an air ambulance accident, or you have lost a loved one in a medical helicopter crash, contact an experienced aviation accident lawyer near you. Aviation accident lawyer Jonathan C. Reiter. T: 212-736-0979.